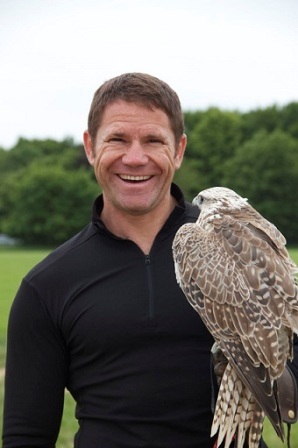 A guest blog this month comes from BBC wildlife presenter and Strictly Come Dancing star, Steve Backshall. Easter and its lure of chocolate hold nothing over me: Easter is a time for doing adventurous things. So when I got booted off Strictly, signing up to kayak the 125 miles from Devizes to the Houses of Parliament the following Easter was an obvious distraction! I was spending all day of every day inside a dance studio and needed something to get my teeth into outside. I trained hard from the Sunday morning after I got booted off and was kayaking almost every day, often doing marathon distances. I teamed up with my pal George Barnicoat from the Canoe Club. Was it as hard as Strictly? There’s no comparison! Well, other than my partner was shouting at me, my backside hurt and I was wearing Lycra. One of the worst things about endurance racing is that you forget all the horrid bits; the chafing, the fatigue, the fierce lows, sitting in your own wee in a kayak with every muscle screaming at you and your brain trying to shut down. All you remember are the good bits. So I’ve said I’ll never do it again, but the reality is I’ll have changed my mind in a few weeks! I’m an avid outdoorsman and explore the globe making programmes about our wonderful world and infinitely beautiful wildlife, so the environment is very special to me. This kayak race was to raise funds to buy and protect a section of Colombian rainforest, saving it from logging, poaching and any other form of exploitation. I spend so much time in the rainforest I get to see first hand how wondrous it is, but also how fast it’s disappearing. I desperately wanted to do something tangible, and the World Land Trust that was my nominated charity [the www.worldlandtrust.org] allowed me to do that. We were aiming to finish inside 24 hours and we did! We pulled it off: 125 miles paddled in 23 hours and 17 minutes. We finished outside the Houses of Parliament on Easter Sunday morning, after a hellish first day, and a strangely tranquil night of non-stop kayaking. Sore, chafed, muscles screaming and desperate for sleep, but very proud! We were hampered by not one, but three rudder wire snaps. One of these happened in the middle of nowhere, meaning we had to run with the boat on our shoulders for maybe half an hour. George showed great fortitude, battling on despite neck and back pain, and some real low points in the night, where he kept falling asleep at the paddle! But somehow we managed to make the tide at Teddington. The banners, cheers and wishes along the route were hugely appreciated: they carried us through the darkest hours. We thank all those that sponsored us too and because of them we have raised enough money to buy around 500 acres of primary rainforest in Colombia. I first started doing jungle expeditions in the late 90s and some of the places I go back to now are unrecognisable. If we don’t do something very soon, we will alter the planet’s systems so fundamentally that there will be no going back. Supporting the World Land Trust is my way of doing something tangible.